Astrology is based on the study of the cycle motions of celestial bodies surrounding the Earth, but it is also concerned with the motions of our planet, for these alter the relation of every point on its surface, where men are born, to the Sun, the planets and the stars. The Earth rotates around its axis in about twenty-four hours; this motion defines the day period. The Earth revolves around the Sun, and we call the time taken by this revolution a year. We also have to consider another motion — a slow gyration of the polar axis of the globe which takes nearly 26,000 years for its completion. Because of this third motion, the poles do not point to the same "pole star" as they did a thousand years ago. In some 13,000 years our pole star will be the great star Wega. It was also the pole star around 12,700 B.C. These three basic cycles — the day, the year, and what I have called the Great Polar Cycle — have different meanings in astrology. The day-cycle refers to man's individual consciousness, because during its twenty-four hours a person normally passes through the several types of consciousness, including apparent unconsciousness or sleep, which are natural to the human species. (1) The year-cycle is linked with annual changes in the vital forces that pervade our biosphere, because it deals with the ever-changing relationship between the Earth and the Sun, source of practically all life-energies. The Great Polar Cycle, which also refers to the more popularly known cycle of precession of the equinoxes, transcending as it does the life span of living organisms and human beings, helps us to measure vast planetary changes. The growth and decay of civilizations is in some manner related to that cycle and its twelve subdivisions, which the astrologer calls "precessional Ages." The gyration of the Earth's polar axis also affects the position of the equator in relation to the plane on which our planet revolves around the Sun, the ecliptic. The line formed by the intersection of the planes of the equator and the ecliptic — which differ by some 23 degrees of celestial longitude — is the line that links the spring and fall equinoxes. They are called "equinoxes" because when, in its apparent geocentric motion, the Sun reaches the two ends of that line, days and nights are of equal lengths. If at the exact time of the spring equinox we were to draw a line from the center of the Earth to the center of the Sun, and we continued this line until it reached a star in one of the zodiacal constellations, the star thus hit would not be the same this year as it was three thousand years ago. These two stars would belong to two different constellations, or groups of stars. Today the star would be in the constellation Pisces — but not in the zodiacal sign Pisces, for constellations and zodiacal signs are two different things. Three thousand years ago it would have belonged to the constellation Aries. It is the shift of such a line linking Earth, Sun and stars at the exact moment of the spring equinox which constitutes the "precession of the equinoxes." The term "precession" refers to the fact that this line — not the Sun! — is moving backward in the zodiac; thus from the constellation Taurus, to Aries, Pisces, Aquarius, and so forth. 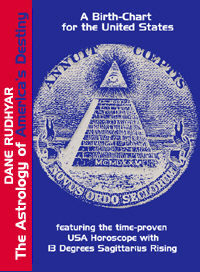 When this line reaches Taurus, the astrologer says that mankind lives in the Taurean Age. We are now at the close of the Piscean Age and, as is now so well known, we are looking forward to the coming of the Aquarian Age.